Happy New Year! I hope 2012 brings peace on Earth, and may all your best wishes come true! 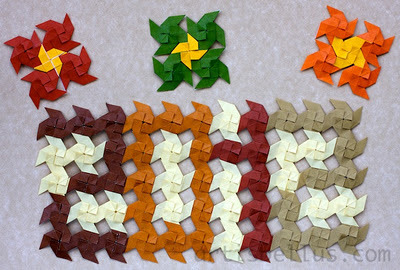 The 2012 quilt was made with 55 double windmill modules, and each flower was made with 5 double windmill modules. The modules were created by me, and each one was folded with a 2 ¾"(70 mm) square of regular origami paper. To celebrate the New Year, I made a video showing how to fold the Double Windmill Module and Flowers. As shown in the video, there are many different ways in which you can connect these modules. By playing with them, you can obtain several beautiful patterns. You can see more examples here.